Coincidentally, I’ve just seen “Marrowbone“. A film about someone who has difficulties in processing the loss of a loved one. And when I was about halfway with “Jack goes home“, I realized that I was watching a similar story. And it might be that the ultimate outcome is identical. I wasn’t far wrong. And to be honest, I thought this intriguing film was slightly better than the previous one. And this only because of the brilliant acting of Rory Culkin. A portrait about how madness takes over someone’s personality. Hey, it’s Kevin .. but older … and more confused! I hadn’t seen the name of the actor who’s playing the leading role. So I was wondering for a long time where I had seen that face before. And when I finally found out his name was Culkin, it hit me. Damn, he looks a lot like his brother who made a couple of burglars their lives a hell in “Home Alone“. But I must confess that his acting performance surpassed everything that his famous brother Macaulay ever did. As Jack, Rory displays a whole range of feelings and moods. From pride to indifferent. From sadness to calmth. One moment he tries to unravel an old family secret. The next moment he flees into a daze of alcohol and drugs. He even experienced homosexual delusions. And all this after he was forced to return to his parental home because his father died in a car accident. It’s clear from the start that something isn’t right. That indifference with which Jack tells his pregnant wife that his father died. Even though his father apparently was pretty important to him. The way in which he tells in detail about his beheaded father is strange and frightening. On the other hand, though it’s strangely enough also funny in a certain way. The behavior of his mother Teresa (Lin Shaye) is also strange. Perhaps the traumatic effect after the accident? After her outburst during dinner about whether she should or should not mourn about the loss of her husband, you start to think she’s relieved about that loss. Are those dark family secrets real? It results in a complex mother-son relationship which escalates as the film progresses. “Jack goes home” is such a movie that makes you feel uncomfortable. Despite the total lack of bloody or frightening images (even with a creepy attic in the house), there’s this constant feeling of tension. The psychological chaos is a constant in this film. 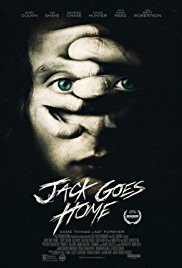 “Jack goes home” balances between a ghost story and a psychological family drama. Jack is involved in a battle with his personal demons and seems to be gradually losing his grip on reality. And even though the characters are of such a nature that there is always the danger of relapsing in overacting, the main actors ensure that they do not fall into that trap. It feels like I’m repeating myself, but the acting of Rory Culkin is fascinating. For me, this movie is worthy a watch. In other words, a must see. And if you get the chance to see it, let me know if I’m totally wrong! Your review seems a far cry from what the trailer offers. Your words describe a dark drama of sorts. The trailer looks to be much more horrific. The film dose look interesting, though.